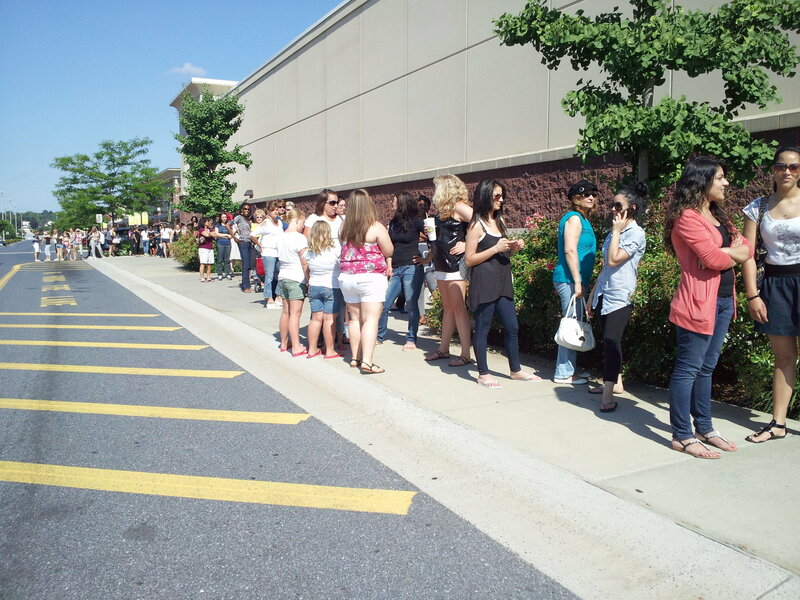 The line outside of J.C. Penney on Friday morning. A mini Sephora store opened within J.C. Penney on Friday. Photo by JULIA HATMAKER, The Patriot-News. Originally published June 15, 2012 on PennLive.com. For a trio of devoted makeup fans, camping out in a parking lot starting at midnight Friday was a price worth paying to be among the first in line for the grand opening of Sephora in Swatara Twp. Yadira Chavez, Brittany Fenser and Katie Chavez of Swatara Twp. stationed themselves in Yadira Chavez’s car as midnight struck, parked in the lot outside of J.C. Penney at High Pointe Commons, where the Sephora store would be. They watched as the gates to the stores were shut around 2 a.m.
Five hours later, they watched as those same gates reopened. The girls piled out of the car and took up seats on the sidewalk outside of the entrance, the first group in what became a long line of about 100 people stretching around J.C. Penney corner. “I mean, it’s Sephora,” Katie Chavez said. For cosmetic gurus, the name Sephora has the same ring Saks Fifth Avenue has for clothing lovers. Founded in France during 1970, Sephora was the open-sell beauty store, meaning customers were free to peruse the store independently, rather than be guided by staff in brand booths. Customers are also encouraged to try and touch all the makeup, nail polish and fragrance items before they buy. Currently the leading perfume and cosmetics store chain in France, Sephora is located in more than 29 different countries around the world. The store’s products include Urban Decay, Smashbox and NARS makeup lines, Philosophy, Murad and Ole Henriksen skin care items and Marc Jacobs, Dior and Gucci perfumes. It is currently owned by Louis Vuitton Moët Hennessy, one of the world’s leading luxury items group. Until Friday, the closest Sephora to Harrisburg was located in Park City Mall in Lancaster. Jen House of Derry Twp., a Sephora girl to the core, was looking forward to saving money on gas. Some midstate locals, such as Carolyn Spawn of Susquehanna Twp., would drive even further, to King of Prussia and Maryland, to get their Sephora fix. Others, such as Karlene Anderson of Harrisburg, would peruse Sephora’s website and dream of a store opening nearby. Read the full story at PennLive.com.